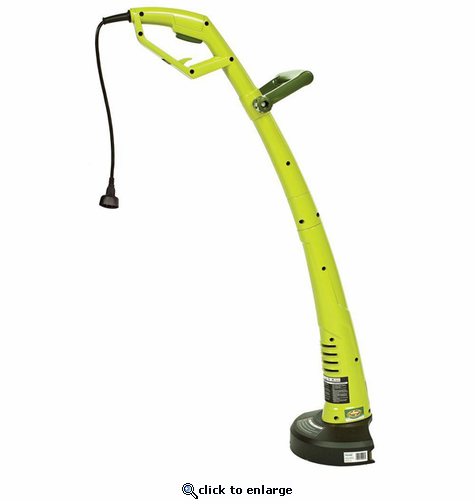 Keep your lawn fit and trim this spring with the Sun Joe® Trimmer Joe 3-amp electric trimmer. A must-have for the do-it-yourselfer, Trimmer Joe is your go-to garden tool for maintenance trimming after mowing. Weighing only 3.3 pounds, Trimmer Joe is super lightweight and features an ergonomic handle to maximize comfort and minimize fatigue during use. Its compact design makes it ideal for cutting grass in tight spaces especially around small yards, town house lots, patios, stones, flowerbeds and walkways. Powered electrically, Trimmer Joe starts instantly and reliably with the push of a button without having to mess with gas or oil or worry about maintenance, tune-ups or toxic emissions. Simply plug in your Trimmer Joe, fasten your extension cord to the cord lock, squeeze the push button on the handle, and watch its powerful 3-amp motor make quick work of your overgrown grass, cutting a 9.45-inch swath with each pass. Trimmer Joe’s bump feed spool system puts you in control over how much line you use. Gently tap Trimmer Joe’s head on the ground to advance the cutting string and continue trimming. Trimming down is easy with the Sun Joe® Trimmer Joe 3-amp electric trimmer—your smart solution to keeping your lawn in tip-top shape this spring. The Snow Joe ® Company designs and develops high-quality, innovative and affordable tools in the lawn and garden sector of the consumer market. The Company launched in 2004 with the goal of creating an effective and easy-to-use snow thrower for under $100. Since its initial success nearly a decade ago with its eponymous snow thrower (the “Snow Joe”), the Company has expanded its line to include a wide range of powerful and reliable outdoor lawn products - from snow throwers and electric shovels to lawn mowers, trimmers, hedgers, cultivators, pressure washers, dethatchers, chain saws and more. Snow Joe ® and its sister division, Sun Joe ®, are driven by a robust research and development pipeline that fuses creative design with cutting-edge technology. It was this pipeline that finally brought an efficient GAS-FREE and CORD-FREE battery-operated snow thrower to the market in 2013. The cordless Snow Joe iON series proved to be another success among consumers who demand easy and smart winter solutions. Snow Joe ® and Sun Joe ® continue to aim to help the everyday ‘Joe’ GET EQUIPPED ® with the right tools to get the job done. Browse our complete product guide to find the tools you’ll need to get life's everyday chores out of the way.